BOGOTÁ, Colombia—President Juan Manuel Santos said on Thursday he has extended a cease-fire with the Marxist FARC rebel group until Dec. 31 while his team works with the opposition to save a peace accord that voters had rejected. The president’s announcement, made in a televised address, extends a bilateral cease fire that was scheduled to expire on Oct. 31. Mr. Santos said prolonging the cease fire shouldn’t be seen “as an ultimatum nor as a deadline” on three-way talks that are now taking place among his government, the opposition and the rebels to save an accord that was turned back by voters on Oct. 2. “But I hope that this process to have a new accord is over much sooner,” Mr. Santos said. Mr. Santos’s announcement comes a day after the opposition Democratic Center party sent the government a 26-page proposal calling for changes in the pact that was completed in August after four years of talks with the FARC, short for Revolutionary Armed Forces of Colombia. Many of the proposed changes are moderate in scope, toning down some hard-line positions presented by some in the party, which is led by a popular former president, Álvaro Uribe. The proposal would permit the FARC to keep the seats in congress that the Santos accord gives the rebel group and doesn’t put commanders behind bars, even for war crimes. But it would ban rebel leaders guilty of atrocities from holding office and it would do away with plans for a special tribunal to try rebels and military officers accused of crimes, a cornerstone of the Santos pact. “We reiterate that this is not an issue of cosmetic touches,” Mr. Uribe said in calling for some important changes. But he said it was important to move fast because the cease fire “could degrade over time for those FARC fighters if months and months go by and their morale suffers.” Those rebels need to be fed and clothed, he said, and could be more easily recruited by criminal gangs if there is a long stalemate. The FARC has said it is open to modest modifications while stressing that it won’t return to war. Michael Shifter, who heads the Inter-American Dialogue think tank in Washington, said that all sides are under pressure to produce a deal, including Mr. Uribe. He noted that politically, with the pre-campaigning already beginning for the 2018 elections, Mr. Uribe must show that his proposals led to a better peace deal, not a deadlock. —Kejal Vyas contributed to this article. 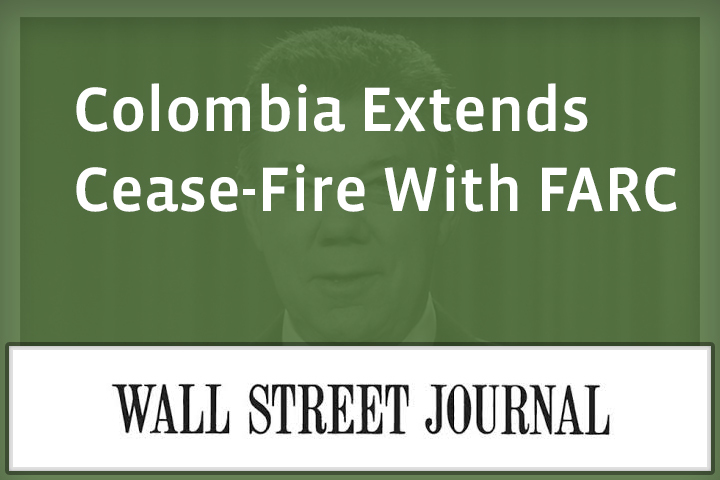 No Replies to "Colombia Extends Cease-Fire With FARC"